One of the most challenging tasks for budding young writers is learning when and how to introduce strong emotion into words. Too little emotion makes the writing dry and boring where too much is overpowering and smacks of insincerity. That’s why its important students learn the function and purpose of exclamatory sentences. Games and activities can make this learning much more memorable and enjoyable. 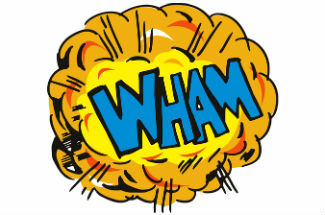 The “Wham” game is a fun way to teach students all about exclamatory sentences. Here is how it works. When reviewing exclamatory sentences teachers explain that these sentences are used when they want to show bold feelings. These feelings can be excitement, confusion, anger, joy, or any other strong emotion. The most obvious difference between exclamatory sentences and other types is that they end in an exclamation mark (!). Fortunately, this makes them quite easy to identify. However, one common mistake students make is placing the exclamation mark in the middle of the sentence instead of the end. Incorrect: Fantastic! your work hard work paid off. Correct: Fantastic, your hard work paid off! Of course, some exclamatory sentences are comprised of just one word called an interjection. Interjections are single words that show strong emotion and can stand alone in a sentence. Or, interjections can be used in a sentence with the use of commas, as shown in the first example. Here are a few more. Wow, that was a great play! Awesome, you won the game! Hey, we’re going the wrong way! Spend some time reviewing these concepts. Then it’s time to play the game! Fit one of the cans with a sheet of colored paper, tape to secure, and write the word “WHAM!” on it. On the other colored sheet write as many interjections as you can think of. Then cut the words into strips. Place the strips in the “WHAM!” can. Wrap the other can in white paper and title it “Sentence Types.” On the other sheet of white paper write a mix of declarative, imperative, and interrogative sentences. You’ll need about 15 sentences. Cut them into strips and place in the “sentence types” can. Divide the class into two large groups, team A and team B, and have them stand on opposite sides of the classroom. The first member of each team comes to the front of the room. One student from team A draws a paper strip from the “sentence types” can, reads the sentence out loud, and identifies it as either an imperative, declarative, or interrogative sentence. If the answer is incorrect, he or she must sit down and the next student from team A draws a new sentence to identify. The student from team B draws an interjection from the “WHAM!” can. He or she must use the interjection to transform the sentence into an exclamatory sentence. This is where it gets fun. If the sentence is interrogative, the student with the interjection must answer with an exclamatory sentence. Interrogative sentence: What is your homework assignment for tonight? Exclamatory sentence with interjection: Fantastic, I have 25 math problems to solve tonight! Imperative sentence: Stop and smell the roses. Exclamatory sentence with interjection: Uh oh, stop and smell the roses! Team A and Team B members rotate drawing from the two cans. The winning team is the team that has the most members standing once all the sentences are read or when the other team has no members standing. Though some of the “new sentences” may sound a little strange, they can be quite humorous. The important thing is students quickly realize the power of interjections and exclamatory sentences and may be much more eager to use them in their writing.